Very well kept home with open floor plan. Wood burning fireplace in great room and covered deck along the back of home. 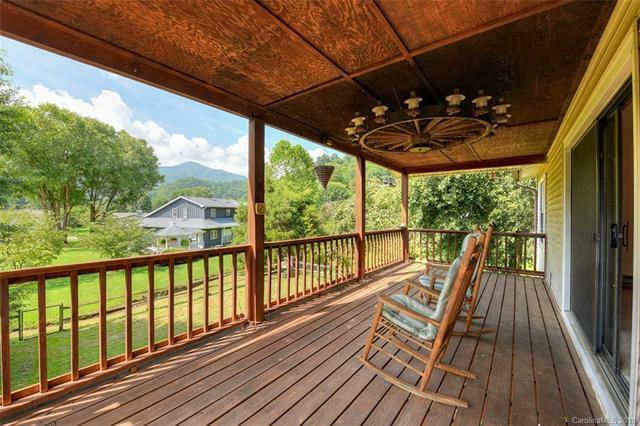 Sit on the deck and enjoy the mountain view and small creek that borders back of property. You can easily live on one level and use downstairs for guests or mother-in-law. Main level has great room, laundry, 2 bedrooms with walk in closets and 2 full baths. Lower level houses 1 bedroom, 1 bath, 2nd kitchen, full bath, dining and gathering area. Oversized 2-car garage in basement with plenty of room for workshop. Level fenced yard and end of road privacy. Maggie Sanitary District provides water and sewer. This property is not in the city limits. 2018 County taxes are $1325. A very small portion of the creek on one corner is in flood Zone X which according to local insurance companies does not require flood insurance. Buyer must confirm for themselves.